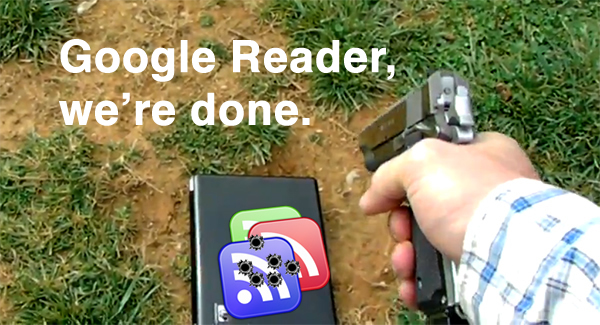 Google’s announcement to put a bullet in Google Reader took the interwebs by storm last week. There are hundreds of posts circulating about why Google did it and all of the alternatives. Image taken from YouTube footage of Tommy Johnson. This isn’t the first time a favorite software has reached its demise. Posterous was a simple blog interface. After Twitter’s acquisition, they tombstoned it. Google Wave & Google Buzz each offered unique albeit flawed solutions to collaboration and communication (building blocks of each appear in Google+). So, why do companies, especially Google, take a popular tool and not only stop supporting it but put a bullet in it altogether? Reader’s death illustrates a terrible downside of cloud software—sometimes your favorite, most indispensable thing just goes away. Yes, software would get discontinued back in the days when we relied on desktop apps, but when desktop software died it wasn’t really dead. If you’re still a fan of ancient versions of WordPerfect or Lotus 1-2-3, you can keep using them on your aging DOS box. But when cloud software dies, it goes away for good. If the company that’s killing it is decent, it may let you export your data. But you’ll never, ever be able to use its code again. This unfortunate reality has bitten me multiple times. Small startups have an idea, head down the yellow brick path to acquisition and when the seed money runs dry, the site turns into a GoDaddy placeholder. But why does a company like Google shut down a playground when it essentially costs them no money? Some companies specialize in keeping the status quo, others specialize in moving forward. Google is the latter. If the company maintained every niche product with N thousand fans, even paying ones, it’d become the very bungling bureaucracy we love to hate. For a company with Google’s ethos and standing, any such dead-end, non-revenue-producing product that’s retained is holding others back, and prevents the company from moving forward and making true innovations instead of incremental improvements. Mahemoff’s argument is the most compelling. Most businesses can throw their ideas against the wall and see what sticks within the safe confines of a conference room. Google, on the other hand, can throw ideas against the wall of the interwebs and see whether it sticks with users, then Google can determine revenue potential. Since Google is an advertising company (and, yes, they are an advertising company), the products that fit into an advertising revenue model “stick.” Reader is in the long line of spaghetti strands to make it to the floor. I have a feeling that Google Alerts is only barely hanging on the wall. But don’t fret, all is not lost. There were RSS readers before Google Reader, and there are still solutions after. Take a tour of some of the roundups out there to replace Google Reader. Bloglines – Hello, old friend. I started using bloglines in the early 2000s. It was my favorite cloud-based RSS solution. Digg name tbd – Digg announced on Thursday (3/14) that they will be building an RSS reader. Feed A Fever – Interesting approach towards prioritization of articles. Feedly – I’m giving it a whirl now. I like the interface, but I’m not crazy about the organization of the feed. Netvibes – Operates similar to content curation dashboards. It’s nice–if you’re into that sort of thing. NewsBlur – Free/Pay – If you liked Google Reader, then this should be a nice transition (except it’s a little uglier). Pulse – Visual web rejoice. This reader does a great job of making a clean, visual interface without only being a content curator. The Old Reader – May surprise me, but I don’t think it will be around for long. Reeder (Mac / iOS) – This is the application that I’ve been using for about a year. Currently, it is a shell to Google Reader. Hopefully they will build out their backend. Have you made the switch? What are you using? Really interesting. I’m quite sad that Reader is disappearing; but when I analyze it, that’s only because it is what I use and already contains all my content. I would love something more functional and beautiful to look at. So this end will probably be the push I needed to find a better solution. I think Feedly is very pretty. Of course, I have invested into the whole Reeder system on Mac/iphone/ipad, so I am hoping that they can figure out a replacement that doesn’t rely on Google Reader.